TO BUY CFD TICKETS, GO TO THE CHEYENNE FRONTIER DAYS&apos; WEBSITE. The Daddy of &apos;em All has been kicking up dust since 1897 with the world&apos;s largest outdoor rodeo and Western Celebration. The first Frontier Days was held as a cowboy roundup that featured bronco busting and steer roping contests as well as pony races. More than 100 years later, Cheyenne Frontier Days is a 10-day festival of rip-roarin&apos; excitement, featuring the world&apos;s best PRCA rodeo action and Western entertainment. It&apos;s non-stop activity and hospitality at its Western best! In fact, Livability.com named Cheyenne Frontier Days as the top festival in the nation in their annual Top 10 Summer Festivals. Cheyenne Frontier Days includes PRCA rodeo & slack events, concerts, Professional Bull Riders, USAF Thunderbirds, parades, pancake breakfasts, Western Art Show & sale, carnival, Old West Museum, and an Indian Village. The lineup for Cheyenne Frontier Days night show lineup is generally announced prior to Christmas. TO BUY CFD TICKETS, GO TO THE CHEYENNE FRONTIER DAYS WEBSITE. Cheyenne celebrates its Authentic West roots each year with the world&apos;s largest outdoor rodeo. The event draws top professionals cowboys, competing for more than $1 million in cash and prizes. Besides the PRCA event, which is called The Daddy of &apos;em All because of the prizes, you can catch the finals of the Championship Bull Riding season, as they crown their champions. Not sure how rodeo works or is scored? Find out about all the rodeo action here! The nightlife at Frontier Days is tons of fun! It goes on each night, Friday through the next Saturday, with rock and country music! Acts are announced around Thanksgiving, so check on the CFD website for more information or call 800-227-6336. It&apos;s not too early to reserve your Frontier Days lodging. Research for hotels here. One hint for you is that when you call the hotel to book your reservation, call them directly on their local 307 phone number for the best availability and rates. One of Cheyenne Frontier Days&apos; most popular events is the Grand Parade, which is held at 9 a.m. both Saturdays and Tuesday and Thursday of the celebration. 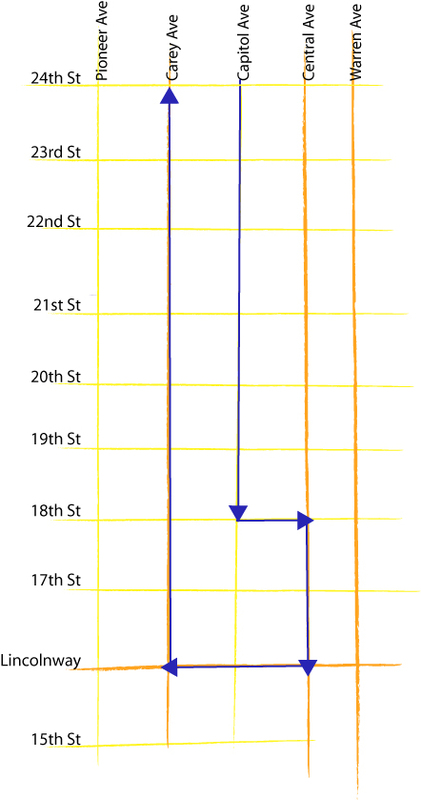 The route starts at the Capitol at East 24th Street and Capitol Avenue, heads south to 18th Street and then east to Central Avenue to Lincolnway, it turns west to Carey Blvd and then ends at East 24th Street. You&apos;ll see floats, marching bands, antique carriages, automobiles and horses with riders in period dress. It&apos;s 90 minutes of cheering fun. The Masons hold a Chuckwagon Breakfast from 7:30 to 9:30 a.m. at their lodge at the corner of 19th and Capitol on parade mornings. And local churches also hold lunches after the Pancake Breakfasts (signs are up downtown to lead you to the vittles!). You think the best part of a Fair is the food on the midway? Well, the good news is you not only get Carnival food at Frontier Days, there&apos;s so much more! Eat free pancakes and get access to barbecue and so much more. Click here to read more!! Everyone gets excited when they see the carnival rides go up because they know things are about to get fun! The carnival runs the full celebration and is open from 10:30 a.m. to 12:30 a.m. every day on the Carnival Midway, Eighth and Dey Avenues. Armbands are $30 for a one-day session. Cost is $5 less for Laramie County residents on "Cheyenne Day," which is Wednesday. The price does not include midway admission, which is $3 per person. You can buy your armbands online here. The Cheyenne Gunslingers perform re-enactments of gunfights and other Wild West activities at noon and 6 p.m. Mon–Sat and noon Sun at Gunslingers Square, 15th and Pioneer Streets. The performances are free. The Indian Village is open from 10 a.m. to 7:30 p.m. the first Saturday through the last Sunday at the southeast corner of Frontier Park, Carey and Eighth Avenues. Various Native American vendors with food, arts and crafts are available all day, with special entertainment throughout the week. The entertainment in the Indian Village is free and is brought to us from the Little Sun Drum and Dance Group, based out of the Wind River Reservation in central Wyoming. Wildly popular, the Frontier Town is open every day of Frontier Days from 11 a.m. to 8 p.m. just south of the Old West Museum and west of the Indian Village in Frontier Park, Carey and Eighth Avenues. Take a step back in time and celebrate Cheyenne&apos;s western heritage with Western merchants, craftspeople, artisans, and even some special guest characters like Lillie Langtry, Buffalo Bill Cody, Wild Bill Hickok and Wyatt Earp. The Old Fashioned Melodrama is always a hoot, and will play at 7 and 9 p.m. the nights of Frontier Days at the Atlas Theater, 211 West Lincolnway. The melodrama is entertainment for the entire family, where you can cheer for the hero and boo at the villain. 307-638-6543. The Cowgirls of the West Brunch and Fashion Show is a popular annual event in the Grand Ballroom of Little America Resort Hotel, 2800 West Lincolnway. Featuring fashions by Just Dandy, Out West & Outstanding fashions from Cheyenne’s Premier Western Fashion Store. Plus Silent Auction, Jewelry, Rodeo Queens and more. Reservations are required at 307-632-6068 or visit their website. The first civilian air show ever performed by the Air Force Thunderbirds was at Cheyenne Frontier Days in 1953. They have returned each year to fly on the Wednesday morning of the festival. They are often seen around town at autograph signings! The USAF Thunderbirds Air Show will be at 9:30 a.m. Wednesday above Laramie County Community College (LCCC map and parking information here), 1400 East College Drive. The Thunderbird Air Show begins at 9:30 a.m., but all access roads will be closed from 9-10:30 a.m. Please plan your arrival accordingly. Parking at LCCC begins at 8 a.m. Remote free Park ‘n Ride lots start also at 7 a.m. and are at Holliday Home Plaza, Nationway and Windmill Road (Ashley Furniture parking lot) and Cheyenne Plaza, East Lincolnway and College Drive (Hobby Lobby parking lot). The last shuttle run is at 9 a.m.
Before the Thunderbirds fly, enjoy fun activities and music from a live active duty Air Force Band! LCCC student groups will sell refreshments and Thunderbird T-shirts. Don’t forget your lawnchairs, umbrellas, water and sunscreen (sunglasses too). For information, call 778-7200 or 800-227-6336. The team is the official parachute demonstration team of the United States Navy and part of the United States Naval Special Warfare Command. The team is made up of active-duty Navy SEALs, Special Warfare Combatant-craft Crewmen and support personnel. Hometown heroes from the Wyoming Air National Guard are providing the jump platform - a C-130 - for these demonstration performances. During their rodeo performances, the team will be jumping into the arena during the National Anthem around 12:15 p.m. The FE Warren Air Force Base will hold a three-day open house honoring their past as Ft. D.A. Russell and all they have achieved through the years with missiles and now with NASA. The base will be open from 9 a.m. to 9 p.m. the first weekend at the Base, Interstate 25 and Randall Ave. All events are free except where noted. Learn more about this fun three-day event here. Parking can be a hassle during Frontier Days as the neighborhood south of the park quickly fills with vehicles up to eight blocks south and 10 blocks east of the entrance. To avoid a long walk or an expensive ticket (breaking parking laws WILL result in a towed vehicle), you have options. Click here to learn more. Mark your calendars!! Hope to see you at a future Cheyenne Frontier Days.